If a restaurant is named after the cured back fat of a pig, you can expect that charcuterie is among its specialities – and so it is here. But lardo itself isn’t on the menu at Lardo, except as a pizza topping, so our charming, clued-up waiter bought a plate specially. It was excellent, as was the paper-thin fennel pollen salame. Other small plates on the short menu are divided into ‘cold’ (simple but satisfying puréed cannellini beans with black olives), ‘warm’ (an unctuous bowl of braised chicory and melted fonduta cheese topped with speck) and ‘hearty’ (Venetian lamb’s kidneys). There’s also a couple of own-made pasta dishes and a handful of pizzas with novel, tasty toppings such as goat’s curd, anchovy and sprouting broccoli. You can watch the pizzas being fired if you choose to sit on the stools around the open kitchen; otherwise there are closely packed but not cramped tables. Industrial-style windows, plenty of wood, and lighting that’s so low most people need to use the tealights to read the menu, make for a stylishly casual setting. Lardo is part of the Arthaus complex, so it’s a trek across a blinding white foyer to find the shared toilets. Drinks run from cocktails to builders’ tea plus a brief, mainly Italian wine list. 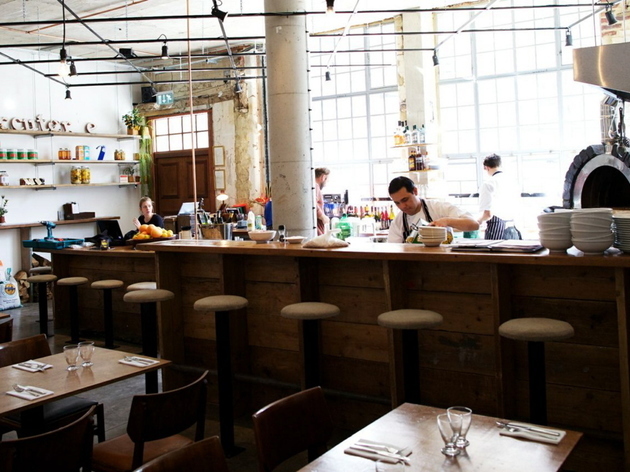 Hackneyites love this place – rightly so – and cram in from breakfast to late, so it’s wise to book. Small, quaint, boutique restaurant which I celebrated my birthday in some years ago, we've been back a few times and the food has always been spectacular. The stylish space is great and the open kitchen adds to the theatrics. The only slightly disappointing thing is that the service does not live up to the quality of the food. Mixed feelings - delicious starter of parma ham with melon but slightly disappointing ravioli main and service a tad slow though friendly. Didn't get a chance to try the pizza though. I can appreciate what Lardo are trying to do, however I don't think they are quite there yet. They have tried to create a more interesting and different pizza menu from the norm, however if they stuck to more original ideas it may work better. The bases were both fine but neither myself or dining partner ate more than half, very unlike me for a pizza! The restaurant itself is lovely and the staff are very friendly. Unfortunately though, the food is not great. Terrible restaurant. The place was empty and were were the only table. Ordered a VEGAN pizza and was given meat sausage. Its the kind of mistake you don't make, especially i as it was so empty and you only have 2 orders to take. Will never come back here again after having eaten meat after being a vegan for 6 years. Was so upset. Lardo you need to train your staff to focus and double check orders. If I was allergic to meat I could have sued the place. Unexceptable mistake. Stay away if you have any allergies / food preferences. Love this place! When I went we had a seat at the bar and got to watch the food being prepared fresh. Really tasty food and good atmosphere. Whether popping in on my own, on a date, with one friend, my parents or a group, the service is always excellent and my companions delighted. Only ever had 5 star experiences in terms of the food, drink and staff. 100% my favourite local. Always keen to return to this reliable Italian joint in Hackney. The staff are attentive but down to earth and know the menu inside out. Pizzas are great, but even side salads shine here. And the affogato with sherry instead of espresso is a proper naughty treat for pudding. I was always passing it by, whenever around London fields area and it was on my list of places to try. 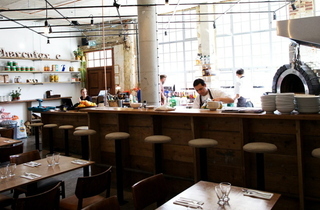 Restaurant has a warehouse kind of feel, with a couple of tables outside as well, which is perfect for summer. Vibes: Hackney Cool. If you own dungarees, have your hair up in messy bun and have septum pierced, this is your place to go. Staff is very relaxed, maybe even too relaxed for their own good, you will wait for food and drinks for a while. They have happy hour for Aperol Spritz for a fiver and are known for their pizzas, but we offered a variety of small bites which were good as well, although well overpriced. It does seem a good place to visit if with larger group of friends , because of the big table arrangement. I’d say, 5 stars for the vibes, 3 for food and prices. The pizzas here are insane. Thin, crispy, original and fresh toppings - you really can't go wrong. Best time to visit this place is during a sunny day. Sit outside, order a starter of their ridiculously creamy Burrata, followed by the freshest Italian pizza in town, and wash it down with an Aperol Spritz. This is my favourite place in East London for brunch. The poached egg and bacon with pesto is great and the Bloody Mary with capers and anchovies is incredible and probably the best hangover cure going. I would give a 5 star rating but I haven't tried the dinner menu for a few years. My friend and I had a lovely lunch yesterday! The waiters were very attentive and super friendly and not disruptive when in the middle of a conversation, they rather waited and picked the right times to come to the table to ask for orders. The food itself...what can I say...fresh, yummy and colorful! The menu is simple and I like the fact that there is not too much choice, gives it clean lines. The wine was beautifully picked by the waitress and the cocktails refreshing for a hot summer day. The outside are, although right by the street, is very nice and again shows the restaurants' vibe. you can see how food is prepared in the kitchen. I have been to Lardo before for dinner, which has been amazing too, but I would definitely choose to come again for lunch! The staff are so inconsistent. I have had two meals here, the first one was excellent and had all the ingredients for becoming one of our regular places. The second was with my parents from out of town. The waitress took one look at us and decided we were not suited for the place and was rather rude and offhand from then on. It was if she wanted us to leave immediately and went on the offensive to persuade us to do so. The quality of service really spoilt the meal and we could not really think of the food due to the rather mean spirited staff, I for one will not return and I live on Horton Road around the corner and would have relished making this my regular. Our experience was: impeccable service, super-friendly and cute front of house staff; and kitchen taking pride in what was being sent out (rightly so). Food was delicious. Agree with SamNad: loved it, would recommend it and will go back. Good experience - restaurant busy but attentive service; excellent starter of frogs legs; superb pizzas and good value. If I lived locally would most definitely visit regularly. [There is a problem with keeping the high ceiling venue warm and free of draughts - so don't sit near the doors - in these winter days, but that is not something fatal to a visit!!]. Looks like somone has it in for Lardo, and can't believe I ate in the same restaurant. I was in for dinner last Saturday and although it was busy we were greeted by an especially attentive waitress. She talked us through the menu and recommended us some fantastic dishes and was friendly and approachable... we weren't too pleased to be sat up on high stools over looking 2 start with.. but by the end of the meal we had forgotten! Great food and great service! Great to go there but rude on the phone, hard to get through to reserve as they also never seem to answer it! Nice atmosphere though. A constantly changing menu filled to the brim with lots of weird and wonderful choices that just keep me coming back for me. I've had the pleasure of being surprised on my birthday here, where a special order was prepared just for me. Our repeated returns have always been well received and the dishes have been gorgeous every time without fail. A splendid venue just around the corner to us! I found Lardo to be a real joy. It's just so beautifully friendly and stylish; so relaxed. The food was great (Sunday lunchtime), and they even paid special attention to my daughter who can't eat a couple of things. They were happy to go a bit off-piste with the menu and cater for her, which is rare, and they did it brilliantly. It's like a little world away from the hustle and bustle. I'm looking forward to going back for a proper night out. An altogether underwhelming experience for our party of four looking for a relaxing Sunday lunch. Tables are tightly packed and the place had a good warm buzz to it, so we had high hopes. But the food and service were both lacklustre. Pizzas were bland and lacked toppings. I'm happy to pay for quality ingredients too, but more than £5 for a tiny ball of burrata took some shine off the milky delight. My friend's cacciatore was tasty but hard to eat in an impossibly small bowl. The sharing menu didn't really give her any ideal pairings for the meat either, so she settled for a beetroot salad. Further disappointment came when our chosen sweet was unavailable due to a 'cream malfunction'. Given there were only two to choose from in any case, we ended up settling for coffee and mused at why some more cream could not be whipped for the promised pistachio cannoli. We wanted to like this Hackney local but won't be back. When we next crave pizza we'll be heading back to Crate - the menu might not be as extensive but the pizzas are much tastier and the staff much friendlier. The best pizza i've had for some time, great service and great atmosphere. Brown shrimp a little disappointing but everything else was bang on. Great addition to Hackney. Beautiful setting, good ingredients, but left hungry and frustrated by bad service and small, expensive portions. Was not given a menu until we asked for one. Service was haphazard and left you feeling as if you were ruining their night by ordering food. Nice place, good food, BUT, very expensive, small portions, and worst of all, badly trained waiting staff.......would not recommend. Spent a very pleasant couple of hours over brunch at the weekend. I didn't find it too expensive - there's certainly a lot of love that goes into the food, and you can tell. The best eggy bread via Italia that I can remember ever tasting, and my friend told me she enjoyed her ham and egg pizza (a breakfast pizza, that's another first for me!). I wouldn't want pizzas any bigger or I'd burst... I'll be back for sure. A rather frustrating experience. A difficult menu to digest - with plates so small and prices which are too high. A good selection of wines - but served in a glass so small. The food quality was good but I wont go back nor recommend to anyone else. I left feeling hungry rather disappointed and certainly not satisfied. Small and slightly complicated menu. Portions are tiny prices are not. Pizza was small for the price and the little flavour it has was quite greasy. Will not bother to go back. Been a couple of times and really like it. Glad we have missed the rude waitress - our was charming. Great pizza and lovely charcuterie. Horrible little thick wine glasses are style over substance. The pizzas are great I must say, but £4.50 for a bottle of beer/ tiny tumblers for the wine, both really make you feel like you have been ripped off. Its a real shame as the decor is fantastic and the service is good too, but ripping people off with beer and wine is really silly- the mark up is so obvious its ridiculous. We decided to try out Lardo and give it a go but quite frankly its not really all that! The pizzas were overpriced and nothing special. In fact the price of the pizza advertised on the menu doesn't include the VAT so you get a surprise extra portion on top of your bill at the end of the night. That's if your bill arrives, we waited 15 minutes for our bill to arrive as its was being hand written...!? When it eventually arrived it was wrong, they had accidentally added on an extra bottle of red wine. Fortunately I was dining with out with people that can do maths so we soon spotted this error, when we showed signs of looking baffled the waiter approached us to point out 'we weren't sure if you had drunk 2 or 3 bottles so we decided to make if 3' and he hurried off to correct the bill. He was very polite about this if slightly embarrassed. Beware of the spicy sausage pizza as it really is spicy, it nearly sent my friend into labour! It blows your head off and you end up looking similar to Leslie Ash at the end of the night. Saying all that the restaurant is cosy and warm with the pizza oven churning out plenty of heat, the lighting is dim so make sure you wear your reading glasses and bring a calculator along to tally up at the end of the night. I went for a friend's birthday, 6 of us including 3 Italians who know their stuff and we really really enjoyed the food. The burrata was the best! everything was tasty and I can't wait to go again. Also wished their desert menu was a bit more extensive and the service was a bit grumpy few times but the food made up for it. My friends and I had a fantastic dinner in Lardo. All meals and drinks were so delicious. My favorite was starter “veal meat with tuna mayonnaise”. We absolutely loved the restaurant and will definitely come back again. Thank you for a great evening! Food is good but presentation is poor and service is awful. I was hoping for much more from this place. We also had a really bad experience of being put at the bar. However it wasn't the bar but the alley way which all the staff used to get to the kitchen. My friend was constantly pushed and naturally got very frustrated. When we complained, they basically gave us some money back and said it was the nature of sitting at the bar. What we wanted was a sincere apology for ruining our night. They also got all our order wrong and treated us like it was our fault. Food was ok but service really let this place down. Shame as it is actually our local. The food is delicious and it is a gorgeous restaurant. But it does not represent good value for money- which is a shame because it could be really good. Our lunch cost £38.50 which got us a tiny bottle of diet coke, a tiny lemonade (mostly ice), two little tumblers of wine, one side salad and two pizzas. The pizzas are freshly made and so delicious, but on the courgette flower, goats curd and anchovy one we had only one halved anchovy on the whole pizza. I'd love to leave a glowing review, because I think this place could be worthy of it, but they need to give better value. The whole experience felt overpriced, and although the pizzas are on the smaller side of decent, the toppings are remarkably meagre. really delighted to see this place in hackney. we have surprisingly few good local restaurants that are not vietnamese or turkish (barring of course the excellent railroad). had the same experience of a surly waitress - which eventually became quite comical, and the eggs i had for breakfast didn't have enough cheese in them and as a result tasted a little bit bland. this was all made up for by the burratta which was amazing, and the promise that this could become a really exciting place to eat. I went a few weeks ago. We were 7 people - the food is amazing. Service was sublime. The food here is legendary - incredible tastes that transport you to a million places. Lucky people of Hackney.